French colonel; born in the department of Meurthe in 1808; died in Paris June 13, 1884. At the age of twenty-six he entered the military school of Saint-Cyr, and upon his graduation was appointed tutor, gradually rising to the rank of captain. He so distinguished himself in the suppression of the Paris riots, June, 1848, that he was appointed chief of battalion. In the Crimean and Italian wars he took an active part, and was promoted to the rank of colonel in 1861. He later became officer of the Legion of Honor, and was placed on the retired list in 1868. Boris always took a lively interest in everything relating to Judaism. 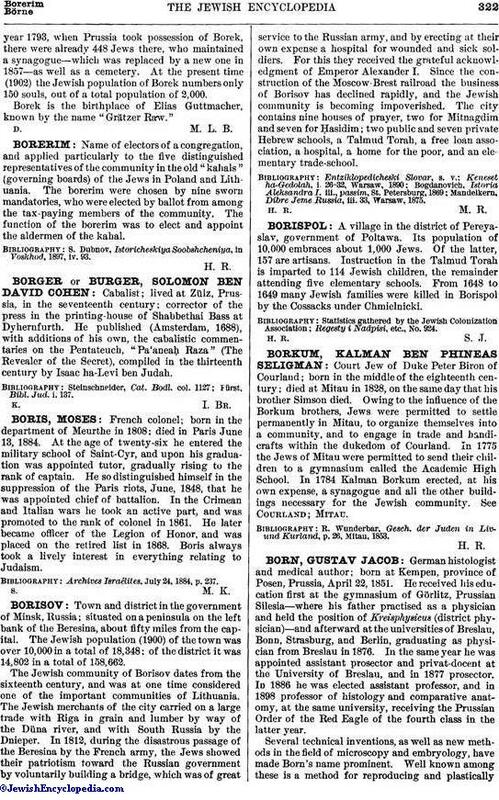 Archives Israélites, July 24, 1884, p. 237.